LaView Video Doorbell - Get next-level security and convenience for your home safety. Armed with motion-activated alerts, 1080HD video and two-way talk.Remotely monitoring through phone app lets you watch over your home no matter anybody rings the bell or not. Answering the door wherever you are. Day or night, rain or shine - you’re always home. The LaView Doorbell camera is providing accurate motion detection so that it can instantly alert you with a push notification when someone walks up to the door. Connects to existing doorbell wiring (16-24V AC wiring required), so you never have to charge a battery. Field of View: 180 (horizonal), 96 (vertical) viewing angle. 【1080P HD and Smart Night Vision】 The 1080p/30fps resolution and WDR function delivers clarity picture in any different weather conditions. The video doorbell features infrared night vision that you can see in the dark up to 15 feet. Capture clearer details and provide safety in day and night. Requires new or existing 16-24V AC wiring or transformer. Support connecting to the mechanical chime. Only support 2.4GHZ WiFi band, 5GHZ network currantly not supported. 【Enjoy 180° Viewing Angle Field】 This WiFi doorbell camera provides wider viewing angle with 180° coverage, you can see a ultra-wide window to front doorstep so that you may stay connected to your home security from wherever you may be. 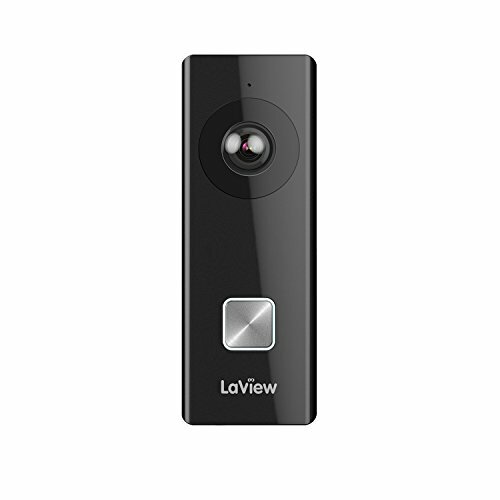 Reliable WiFi connection is easily to access your doorbell camera with mobile App “LaView Connect ” on iPhone or Android smartphone. 【Security in Your Hands】 Get instant alerts when visitors press your WiFi doorbell or trigger the built-in motion sensors when motion is detected in the detection areas. Have the ability to customize exact areas you always want to be alerted whenever there’s any movement. It solves the problem if your camera must face a busy street - so you only get alerted to what’s only important to you. 【Weatherproof Guard】 IP54 rating makes LaView doorbell camera suitable for outside use and keep recording in the ever-changing outdoor environment no matter rain or shine. Operating temperatures can be anywhere between -22­° F to 122° F.
【Three Faceplates Included & Warranty】 Three Interchangeable color faceplates included in your purchase - silver, black, and Charcoal Grey. This doorbell camera equipped with a 16GB micro sd card, when sd card memory is full, it will automatically covered by new video and pictures(Max to 128GB). Our store provide 1-Year-US warranty and Lifetime Technical Support provided directly from LaView.